Fincher & Ozment, the premier Tuscaloosa AL jewelry store specializing in diamond and custom jewelry. If you want to grab ten rings and try one on each finger to see which you like best, you should be able to do that – without having to ask a commissioned salesperson for help. Plus, there should be a price on each ring so you know how much everything costs. 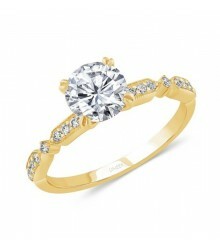 And since you are going to wear your ring forever as a symbol of your love, it should be made especially for you. Yours should be the only finger it has ever been on. Want to know more? It’s called the Love & Affection Collection, and it is a whole new way to shop for your engagement, wedding and anniversary rings. 1. Your ring is made especially for you using your style and budget specifications in 10 days or less. 2. You get to see West Alabama’s biggest engagement ring selection. 3. You will find the latest collections from leading designers like Simon G.
4. You do not have to play pricing games. The price on the tag is the real price. 5. Your diamond is backed by a Diamond Grading Guarantee. 6. You can trade up your original Fincher & Ozment diamond at any time. 7. Tuscaloosa has been coming here for their jewelry needs for over 105 years. Would you like to see what they said about their experiences? 8. We love ‘Bama, know jewelry and don’t take ourselves too seriously. Find out more about us and our values. 9. We are direct diamond importers. What does this mean? 10. Price matters. You won’t find a lower price on the same diamond elsewhere. And what if I do?